This week I was bombarded with recipes for smashes. So much so that I couldn’t get the idea of purchasing an ice crusher out of my head. Then I found a Bed, Bath and Beyond coupon in a pile of mail and figured I could justify spending on one. I mean, it would be countless happy drinking moments this summer if I had one. Also, if it broke I’m not out a whole lot of money. I excitedly got it home, out of the box and washed it. Opened up a bottle of liquor and…couldn’t get a smash recipe right to save my life. Everything tasted awful. Six tries later I gave up and poured myself some bourbon over ice. That at least didn’t disappoint. I think I’ll post a couple of the recipes and see if anyone has some suggestions; maybe it will help to talk it out. For the moment I’m putting the idea of a smash off to the side and instead using crushed ice for a more solid drink recipe. One I’ve surprisingly never made before, simple in its ingredients yet satisfying in the end result. A mint julep. I’m relying heavily on Jeffrey Morgenthaler’s recipe here. I find him an authority on this recipe, or at least his telling me he is makes me trust him. My only changes are that I switched out bourbon for rye whiskey. And also, I had mint simple syrup I just made so I used that instead of straight up regular simple syrup. 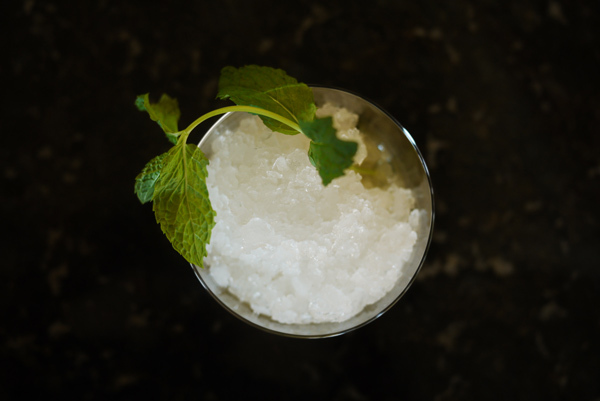 In a wide double old fashioned glass muddle the mint leaves with the simple syrup. Mix in the rye (and it’s totally ok to lick the spoon after you stir the rye. You should taste for sweetness and also, it’s delicious). Mound the crushed ice in the glass and add the mint sprig garnish. All the ice here with the addition of the mint makes drinking spicy rye quite refreshing. I use only a quarter ounce of the simple syrup because I find more than that is just too sweet for my palate. Also, the small handful of mint is really the perfect amount. Much as it would be in cooking, too much actually creates a bitter aftertaste while too little would be lost against the rye. Ice crusher= totally worth it.